"When my kids want to show me something funny they saw on TV, they'll use the DVR to speed up to the good parts, so I see the story zipping by. Once they have me hooked, they'll circle back and show me the middle and, if I'm a good audience, they will rewind to the start. It's a lot of fun to tell the story by rewinding and fast-forwarding and juxtaposing scenes." After George Lucas, James Cameron and Peter Jackson, director Robert Rodriguez can easily be considered of the greatest champions of digital technology currently working in film today. Originally Rodriguez was known as an independent film legend for crafting his first award-winning dazzler El Mariachi for the seven grand he was paid for volunteering to be a medical lab rat. And while it's safe to say that Rodriguez has left the indie world far behind in terms of status and success, one of the most routinely impressive aspects of his style of filmmaking is that he still prefers to handle the cinematography, editing, visual effects, music composition, and other hands on elements himself in a true celebration of the do-it-yourself spirit of his youth. Yet, following the blockbuster smash success of the Spy Kids trilogy of family films, Rodriguez--much like Lucas-- became accused of relying on CGI far too often. Instead of just touching thing up when necessary, CGI became the dominant tool used to heighten any given scene as we witnessed to brilliant effect in Sin City and to a mostly dull outcome in his recent family effort, Shorts. 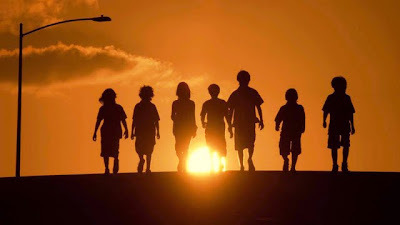 Admirably finding inspiration once again in his five children who have helped provide him with the ideas for earlier works, Rodriguez does indeed opt for the fast-forward, instant replay effect referenced earlier to make the chronology of his movie play like it's a disc left in shuffle mode. However, thankfully he realizes that such narrative chaos would be easiest to digest in small doses and presents his over-the-top sequences in short bite-sized portions. 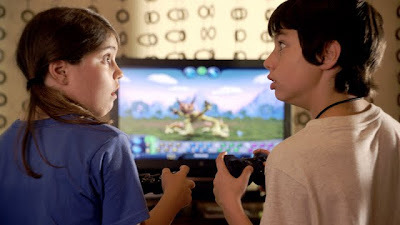 Overall influenced by the Rodriguez family's shared love of vintage Little Rascals adventures, the filmmaker attempts to blend both old school screwball and slapstick comedy with twenty-first century computerized trickery to mixed effect in Shorts. Similar in tone to the same ADD addled urgency used in Spy Kids, Rodriguez tries to pack way too many interconnected fantastical tales in Shorts. To this end, he links them by both an actual and storytelling "device" as well as a geographical one in his quirk-fest set in the Silicon Valley meets Mars amalgam corporate sponsored community of Black Falls. While our young protagonist Toe Thompson (Jimmy Bennett) finds himself bullied by Helvetica Black (Jolie Vanier) on the playground, his parents (Jon Cryer and Leslie Mann) are similarly bullied working for Helvetica' s father Carbon Black (James Spader) at Black Falls' largest employer of Black Box Industries. Spending their days building mysterious Black Boxes that can do everything as if they were the world's most coveted BlackBerry, iPod, computer, kitchen appliance, or electric cleaning/grooming tool, the adults of Black Falls are so caught up in their work that it carries over in their home life. This is evidenced via their growing obsession to their own Black Boxes so much that they text each other messages from five feet away. However, young Toe receives a mysterious gadget of his own that arrives not from Black Box Industries but in the form of a Rainbow Rock. 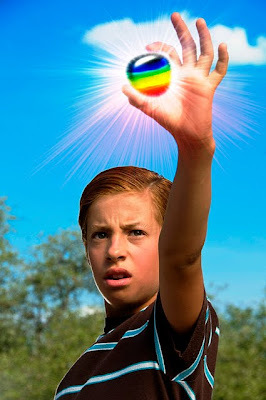 Given the rampant misunderstandings and poor communication in Black Falls (itself a joke as Mann goes to a party dressed as "Miss Communication"), it takes a majority of the movie's 89 minute running time for everyone to realize that the constantly handed off Rainbow Rock is capable of making whatever the bearer wishes come true. In order to blind us to the potential Aladdin like "wishing" cliche of children's fare, Rodriguez pulls out all of his fantastical CGI wizardry to distract us to what is rather a simplistic idea that the ability of the device is overshadowed by its effect as a storytelling device. 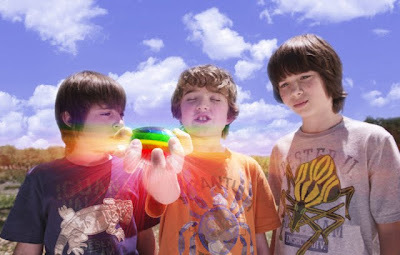 While the Rainbow Rock may enthrall youngsters, essentially it's merely the link that connects the various "shorts" together in driving home his theme that open communication is key. Unfortunately, this valuable message is buried beneath so many outrageous CGI sight gags including a booger over nine feet tall and a few nods to B-movies of yesteryear that it feels like a special effects demo extravaganza on display. Thus, ironically Rodriguez's worthwhile moral of the necessity to pay attention to your loved ones gets swept up by all of the various Black Boxes needed to make the film. Therefore, in the end and despite its adorable opener along with a superlative transfer to crisp WB Blu-ray, Rodriguez's film comes up pretty short in terms of audience empathy with the characters as anything more than merely flickers of computer generated light. FTC Disclosure: As is standard practice for film critics, I received a review copy of the film for this article to evaluate, which had absolutely no bearing on my reaction since neither a Black Box gadget or Rainbow Rock was included to enhance the experience.